Did you know Asheville was voted the #1 place to visit in 2017 by Lonely Planet? Stay with us on the farm!! Two lofts (one with a queen size mattress & one with a single mattress), linens, kitchenette with mini fridge, coffee & press, fold out couch, cold water & electricity. We are a small organic farm located in beautiful Marshall, NC. We are an easy 25 minutes to Asheville, 20 minutes to Hot Springs, 10 minutes to Marshall & Mars Hill and 20 Minutes to the Blue Ridge Parkway & Appalachian Trail. Our farm is 2 miles from a main road. This is simple country living. Come and relax. You will hear chickens and the occasional barking dog etc. none of which are on our property. Self guided farm tour map available. 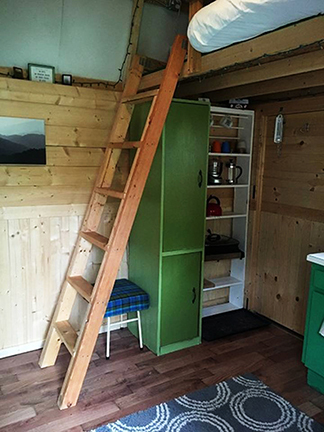 120 sq ft. Bright & comfortable. Two sleeping lofts (one with a queen size mattress and one with a single mattress), kitchenette, electric & cold running water. Stocked kitchenette includes electric burner, toaster oven, electric skillet and mini fridge. 100 sq ft deck along creek. Full private bathroom in short walking distance. Coffee, tea, sugar and press provided. Local farm breakfast supplies available for $20 extra. Includes a dozen local eggs, local bread and Root Bottom Farm jam. Vegetables from the farm available for purchase when available. All linens, organic soap, shampoo & conditioner and towels provided. Stocked kitchenette and empty cabinet for storage. Small library, brochures for local attractions and local hiking/waterfall books available for use. Coffee, tea, sugar and press provided. Kitchenette includes electric burner, toaster oven, electric skillet and mini fridge. Full private bath in short walking distance from tiny house. Towels, organic soap, shampoo & conditioner provided. 10x10 deck off the back overlooking the creek. Self guided tours available and encouraged! !